Treasure Ireland Fruit Machine Guide & Review - Casino Answers! 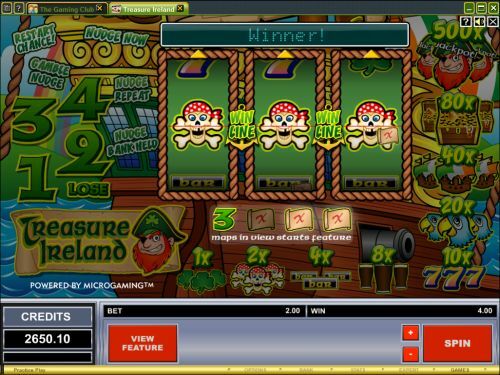 Treasure Ireland is a 3-reel, 1-line fruit machine developed by Microgaming, featuring a hold feature, nudge features and a bonus game. You can play the Treasure Ireland fruit machine at Bovada. Bets on the Treasure Ireland slot machine are $0.10, $0.20, $0.25, $0.50, $1, $2, $5 and $10. You can bet anywhere from a dime up to $10 per spin on Treasure Ireland. To play the Treasure Ireland pub slot, select your bet with the “+” and “-” buttons and press the “Spin” button. The highest paying symbol on the Treasure Ireland online slot machine is the Pirate symbol. If you land 3 Pirate symbols on the Treasure Ireland fruit machine, you will win the 500 coin top jackpot. Randomly triggered during the regular slot game on Treasure Ireland is the hold feature. The hold buttons will show up in the game buttons. You can press each “Hold” button underneath each reel to hold that reel for the next spin. You can reset the hold feature by pressing the “Cancel” button. Another random feature on the Treasure Ireland AWP slot game is the nudge feature. By using the nudge feature, you can press the “Nudge” buttons below the reels to create new winning combinations. You can be awarded up to 4 nudges per spin. Use the arrows above the reels for a preview of the symbols on the reels. The nudges can also be held, gambled and repeated, which are also random features. The third random feature is the Shifta feature. The Shifta will spin the reels into an automatic winning combination. Automatic wins are very nice to get and you can get them when you play Treasure Ireland at Bovada! There are 9 winning combinations on the Treasure Ireland fruit machine. The complete payout schedule is as follows: 3 Four-Leaf Clover symbols (1), 3 Skull & Crossbones symbols (2), 3 Bar symbols (4), 3 Guinness symbols (8), 3 Seven symbols (10), 3 Parrot symbols (20), 3 Pirate Ship symbols (40), 3 Treasure Chest symbols (80) and 3 Pirate symbols (500). 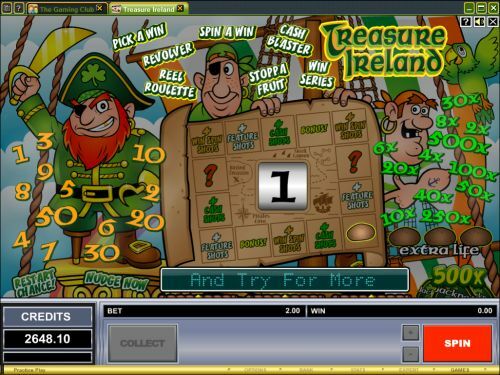 Treasure Ireland has a clever theme that mixes two popular slot themes. For a fruit machine, it doesn’t have a great number of features, but the important ones are still there. On the flip side, it is much simpler than many of the fruit machines around. You can play the Treasure Ireland AWP fruit machine at Bovada! Can players from the United States play the Treasure Ireland AWP slot game? American players cannot play Treasure Ireland for real money at this time. However, you can read our USA-friendly Lucky Last Video Slot Review and play it at Bovada. Where can I play a free flash game of the Treasure Ireland fruit machine? You can play a flash game of the Treasure Ireland online slot at Bovada. You can play it for free or real money. If you have any difficulties with the flash casino, make sure you have the newest version of Adobe Flash Player installed on your computer. You can read more fruit machine reviews on our list of fruit machines at online casinos.